BP Fun theme front page image messed up. If you look at the main featured article on the main page that is not the image I want to show up. I was under the impression that it just grabs your first image in an article but this does not seem to be working. If you click the article you will see the image I would like. I laid them in in the order they appear so it is not like that was the first one I uploaded too. I can't understand why it is grabbing that one for no reason. How do I make that image the main image? In the future what can I do to make sure the image I want is the image I will get. Does the "Featured Image" meta box show on your post editing screen? You can set it there. For reference I think it sets it not by order in the post as much as order of inserting into the post. Where would the "featured Image" meta box show up? I have not used it before and all my other posts have just worked. sort the image on which image to showed...just sort the one you want to top of the gallery. 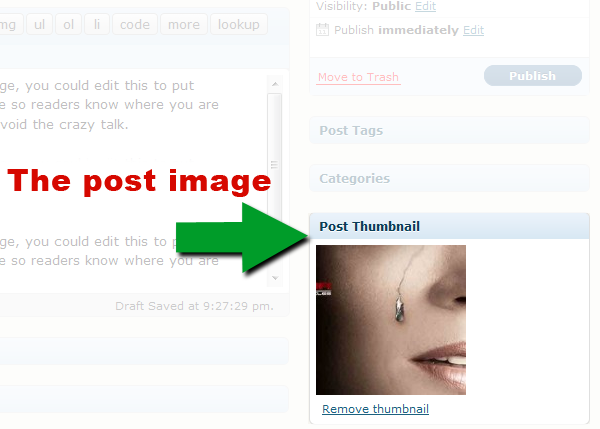 Sorry matera, I didn't realize it used a custom post thumbnail plugin. Aaron, this does not show up in any of my posts. Richie, That is the way I would love it to work. I would love to just sort the images in the order I would like them and then have it grab the first one. But this is not how it works. I have tried that already. I hope we can fix this. is the images you want to showed in internal or external? i mean if the image upload inside your post attachment or an image link from other site. Matera, he means you need to hit the insert image button and sort that gallery. Not the images in the post itself. It is an image I loaded myself. When I go to gallery I can only set the action order. There is no box for the order. I can click assending or desending but that is about it. well it should work....try edit the post and click the gallery tab and there should be a list of images..right? but different auto fetch dimension.. If you can't figure it out you can just delete the images and reupload in the order you want. Aaron can you tell me the plugin that you use? Will that work with this theme? Richie, That is what I did so it is not working. It's not a plugin. The function I was speaking of is builtin to WP2.9 but that is not what the theme uses. Just delete those images in the gallery and reupload. Here is what I see when I look in the Gallery and it does not seem to make a difference. As you can see it is not set to the image I set. did you hit the 'save all changes'.after sorting the image....since it working in my end tho..
which wp/wpmu version you're using? Can you please help me make this feature work on my site. I really need to be able to choose which image to use. I tried doing the same thing on the last post too which has many photos and it will not work once I reorder the images. Do I need to have one of your plugins installed or something to make this work? i mean what the wp/wpmu version you use? also are you in single wp install with bp or wpmu with bp? I have both installed and running. Thanks for all the help. I hope we can figure this out. In the mean time I just deleted them and uploaded them in the order I wanted them. In the future I would like it the way you describe.